True picture book lovers will be bowled over with National Geographic Kids latest title, Why? 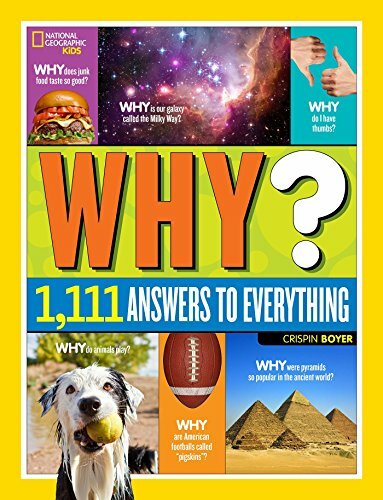 Over 1,111 Answers to Everything by Crispin Boyer. The cover draws readers in with its array of curious photos, like the pyramids of Egypt, the cosmos, and a soaking-wet dog that's obviously ready for a game of fetch. Not to be outdone, the opening pages include a breathtaking two-page spread of a tiny man perched on the crest of a gigantic, red-tinged rock overlooking the Grand Canyon. And things only get better from there. A book that packs this much knowledge would be all over the place if it weren’t well organized. Thankfully, this one is. The chapters are divided into delightful know-it-all sections, like: “You” (how you’re made, why you sleep, etc. ); and “The Earth” (why it spins, why it looks green, forces of nature). There are also sections called: “Sky,” “History,” “Technology, “Animals,” and even “Pop Culture.” Each section lists answers to every question children ages 9 to 12—and even adults—might ask, and the answers range from funny, to quaint, to very serious. The photographs in this book have National Geographic’s touch all over them. There’s a fire that bleeds onto the page in a rage of orange and reds. There’s an in-your-face image of a human brain, a close-up of a puppy yawning that conjures the memory of puppy breath, and an up-close-and-personal photo of an eight-eyed spider and an ornery fire ant that make you want to break out the bug repellent. There are germs congregating in an unsuspecting body, skunks blasting their offenders, buffalos roaming, noses sneezing, zits popping, and a thought-provoking commentary on what toe jam looks like. In short, this book is everything you always wanted to know about . . . well, everything, and then some. The text is written with a lively vocabulary that pushes teens and tweens to expand their minds and challenge their reading levels. This is definitely one for the science, reading, art, or language classroom.